In its early days, Fortnite was a fairly static game. The map was always the same and the only way to get better was to continually play through the same games over and over again. The game has changed over time, though, and the introduction of Creative Mode has absolutely altered Fortnite forever. Now it's possible not just to play around with the world of Fortnite in a way that's never be done before, but to start working on your Fortnite skills in new ways that will help you to bring your game to the next level. Creative mode is actually a fairly new part of Fortnite. Debuting in Season Seven, it was one of the most asked for modes in the game. On a basic level, you can think of it as Fortnite-meets-Minecraft - a way for players to build new worlds without actually engaging in the gunplay of Fortnite. You can use virtually every asset that's currently in the game on your Creative islands, allowing you to not only build some truly amazing structures but for you to create entirely new game modes. Creative is as much about making ATV race courses and awesome skate parks as it is building creative new Fortnite environments. One of the best uses of Creative mode is to improve your own play. You can put yourself into any scenario imaginable to work on aiming, building, editing and anything else you can think of. 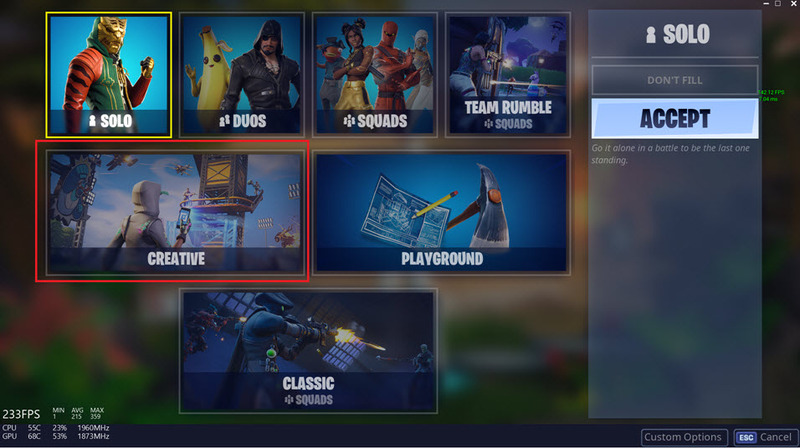 To get into Creative mode just choose it from the game selection screen where you'd normally choose Solo, Duos, Squads, etc. Once you're in the creative hub you'll see some rifts in front of you. To enter a custom training map, walk up to a rift (but don't go in it yet!) and check the hotkey to edit the rift. You'll be asked to enter a 12 digit code which is what will load the custom island. This part is really important because it's how you access all of the custom creative maps. All of the codes we give you below are entered directly into those code boxes in order to unlock each map. Upping your building game is a must if you want to stay competitive. Some of the best building islands include 5618-2963-5299 and 6224-0839-9043. If you want to practice under live fire, 7352-4203-8482 can also be fantastic. What Are Your Favorite Creative Maps? Leave a comment below with your favorite maps and why you like them! Next How Much Data Does Fortnite Use?